No visit to Wisconsin would be complete without a tour of the beautiful 54 acre Memorial Park and its unique tribute to veterans of all wars and conflicts located just 40 minutes North of LaCrosse, Wisconsin, in Arcadia, Wisconsin. It is the largest Memorial Park in the U.S., outside of Washington D.C.
On this page below, you can take a "drone's eye view" of the park and listen to the narration of what this park is all about. 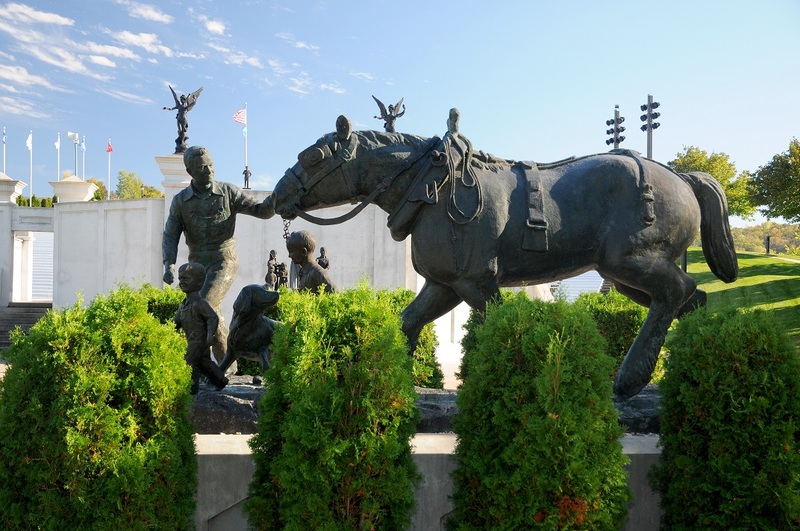 Stroll along the Avenue of Heroes, which is handicap accessible, to witness exceptional memorial statues of the fighting men and women who paid the supreme sacrifice for the freedom we enjoy today. The statue figures were designed by Ron Wanek, CEO of Ashley Furniture Industries, who is also the park's lead benefactor. The Avenue of Heroes Walk is laid out in meters, with each meter representing one year. The Walkway covers 500 years from the establishment of Arcadia in 1848 until 2348. There are Memorial plaques noting events in the history of Arcadia. Be sure to explore the links that show many more tributes and history. What you see on this page is a small sampling of the tributes to this great country, and the men and women who fought for our freedoms. ​Memorial Park and its renowned walk are maintained by the City of Arcadia, members of the community and through individual and corporate donations. EVERY MEMORIAL, EVERY CONFLICT, EVERY HERO HONORED HAS ITS ITS OWN NARRATED DOCUMENTARY, INCLUDING THE HISTORY AND EVENTS LEADING UP TO THE CONFLICTS, AND MORE. The walk begins on the West end of the Park at the visitor center. Walking east you can experience the development of the City of Arcadia, along with the memorials to all wars and conflicts. As you enter, you will see a pillar honoring all POW/MIA. The pillar located on the opposite side honors all of the Silent Heroes of Wars and Conflicts. The Rotunda depicts events and persons prior to the establishment of Arcadia, such as the War of 1812, along with a statue of Andrew Jackson, George Washington, President, 1789-1797, Brigadier Gen. Thaddeus Kosiuszko, a Polish National and a revolutionary war hero. This monument also commemorates the Polish History of Arcadia. 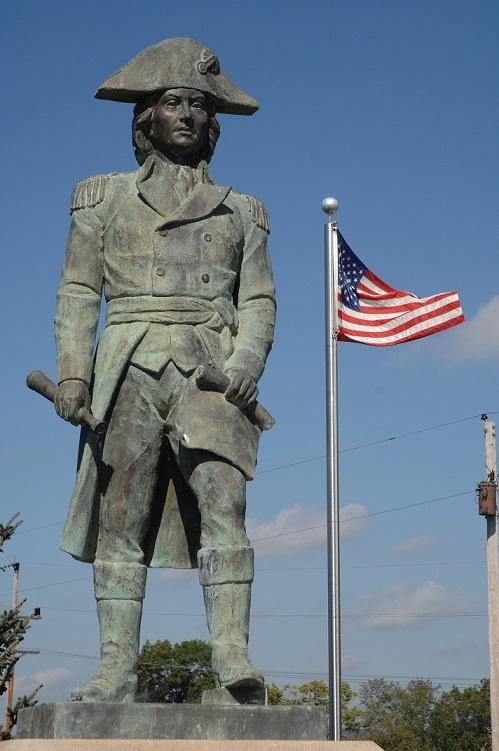 You can't miss the Soldiers Walk Tribute to our First President and leader of the Revolutionary War. 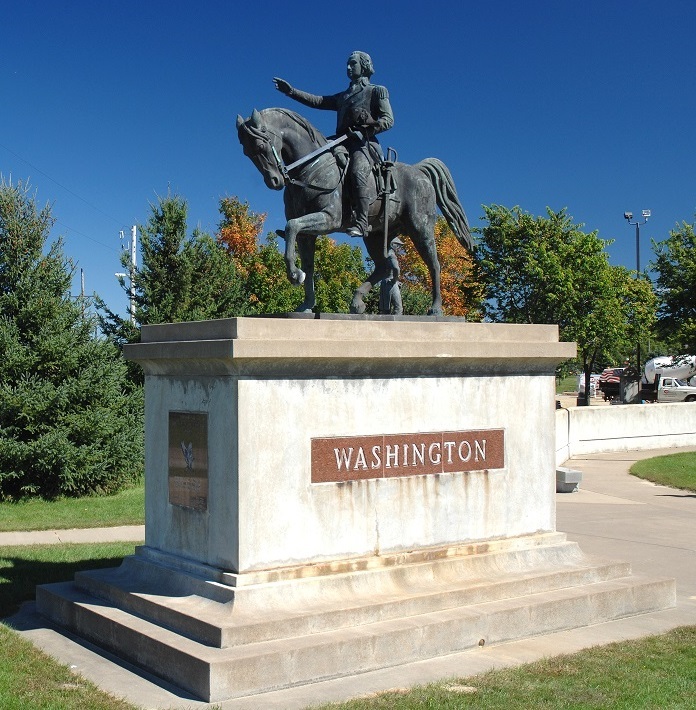 Washington was elected President as the unanimous choice of the electors in 1788, and he served two terms in office. He oversaw the creation of a strong, well-financed national government that maintained neutrality in the wars raging in Europe, suppressed rebellion, and won acceptance among Americans of all types. His leadership style established many forms and rituals of government that have been used since, such as using a cabinet system and delivering an inaugural address. Further, the peaceful transition from his presidency to that of John Adams established a tradition that continues into the 21st century. When you enter the Rotunda, you'll be greeted to a statue and memorial honoring The American Revolutionary War, which was fought from 1775 to 1783. Also known as the American War of Independence, the Revolutionary War began with the confrontation between British troops and local militia at Lexington and Concord, Massachusetts, on 19 April 1775. The conflict arose from growing tensions between residents of Great Britain’s 13 North American colonies and the colonial government, which represented the British crown. Throughout the war, state troops and local militias supplemented the Continental (Federal) Army. The total number of men who served is not known. Men between the ages of 16 and 60 may have served during the war in either the Continental Army, State Line Troops, or local militia mustered to help the Continental Troops. In 1775, when the American Revolution began, there was no regular army. Instead each colony defended itself with a militia made up of local men. With few exceptions, any male 16 or older was expected to participate in the militia. By 1776 Washington had an army of 20,000 men. About one-third came from colonial militia groups, and two-thirds were regular army. Off to one side of the Avenue of Heroes, you will witness an Army tank which was obtained through the efforts of two local Veterans and citizens. 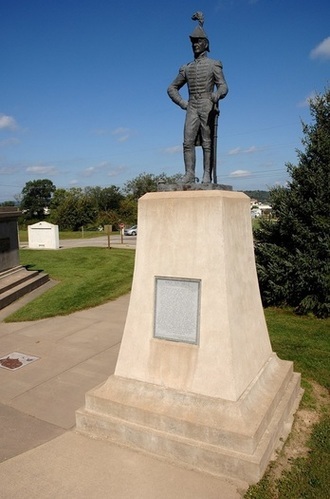 ﻿One of the first statues you'll see upon entering the park depicts a United States soldier in full battle dress. This uniform was stunning and is still used as the model for West Point Cadets at the West Point Military Academy. Many Americans are not familiar with this war between the U.S & Mexico. The war lasted 2 years, but was 15 years in the making due to unstable politics in Mexico and their resentment of the U.S populating Texas. The Mexican–American War, also known as the Mexican War, the U.S.–Mexican War or the Invasion of Mexico, was an armed conflict between the United States and the Centralist Republic of Mexico from 1846 to 1848. Having recently attained independence from Spain in 1821, Mexico was fraught with internal struggles that verged on civil war. Yet In 1836 most Mexicans were relatively united in refusing to recognize the independence of Texas, which had been heavily settled by Americans. As you stroll down the walk, you will see next in view the statue of Abraham Lincoln from the Civil War era. Abraham Lincoln - (February 12, 1809 – April 15, 1865) was the 16th President of the United States, serving from March 1861 until his assassination in April 1865. Lincoln led the United States through its Civil War—its bloodiest war and its greatest moral, constitutional and political crisis. In so doing he preserved the Union, abolished slavery, strengthened the national government and modernized the economy. His Gettysburg Address of 1863 became an iconic statement of America's dedication to the principles of nationalism, republicanism, equal rights, liberty, and democracy. Strolling east again, you will see the Civil War “Boy” Soldiers, which gives recognition to the under-age soldiers who took part in the Civil War. Until well into the 19th century, western armies recruited young boys to act as drummers. Although there were usually official age limits, these were often ignored; the youngest boys, some as young as 9-12 years of age were not uncommon. The drums were an important part of the battlefield communication system, with various drum rolls used to signal different commands from officers to troops. In the noise and confusion of battle, it was often impossible to hear the officers’ orders, so each order was given a series of drumbeats to represent it. 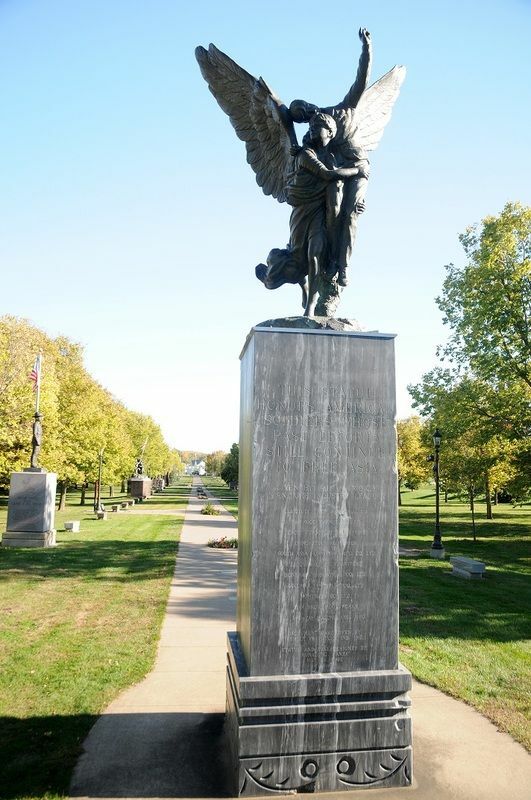 As you start your down Soldier's Walk you will be greeted with an imposing statue depicting the Angel of Mercy. The statue weighs 26 tons, is 30 feet high and sits on a 53,000lb black marble that was mined in Taiwan. During the summer, you will see beds of flowers that are cared for meticulously by volunteers. 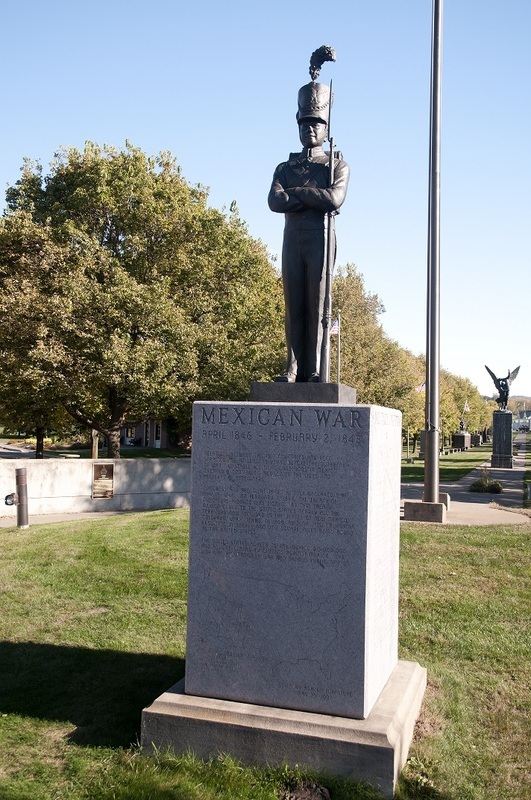 As you continue your stroll down the Avenue of Heroes, you will see a monument dedicated to those who died in the Spanish-American War. It depicts Teddy Roosevelt "Remember The Maine". A bit further down the path is the World War I monument with a Veterans roster on the left of the monument. Here you will find a listing of all of the Veterans from the area who participated in this war. Also known as the First World War, was a global war centered in Europe that began on 28 July 1914 and lasted until 11 November 1918. In America, it was initially called the European War. More than 9 million combatants were killed; a casualty rate exacerbated by the belligerents' technological and industrial sophistication, and tactical stalemate. It was the 5th-deadliest conflict in history, paving the way for major political changes, including revolutions in many of the nations involved. The Division’s history has an honored past reaching back to its antecedents: the fighters of the Blackhawk War; the volunteers who marched off to defend the Union in the Civil War, including the famous 'Iron Brigade'; and the Governor’s Guards who mobilized for the Spanish American War. Almost all of the Michigan and Wisconsin National Guard units which would be combined to form the 32D Division had served on the Mexican Border in 1916-17. The Division served on the front line during World War I from 18 May 1918 until the end of the War on 11 November 1918. It was the first American Division to pierce the famed Hindenburg Line, fought in 4 major offensives and earned the name Lay ter-e-bla “Les Terribles” from the French. The 32D Division was the only American division to be bestowed with a No-De-Gare (nom-de-guerre) by an Allied nation during the war. It involved the vast majority of the world's nations—including all of the great powers—eventually forming two opposing military alliances: the Allies and the Axis. It was the most widespread war in history, and directly involved more than 100 million people, from more than 30 different countries. In a state of "total war", the major participants threw their entire economic, industrial, and scientific capabilities behind the war effort, erasing the distinction between civilian and military resources. Marked by mass deaths of civilians, including the Holocaust and the first use of nuclear weapons in combat, it resulted in an estimated 50 million to 85 million fatalities. 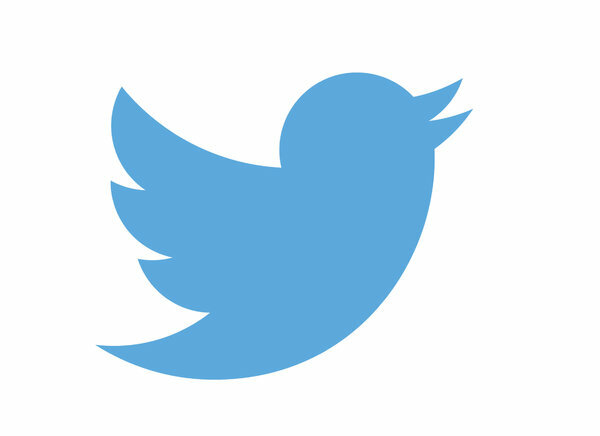 These made World War II the deadliest conflict in human history. 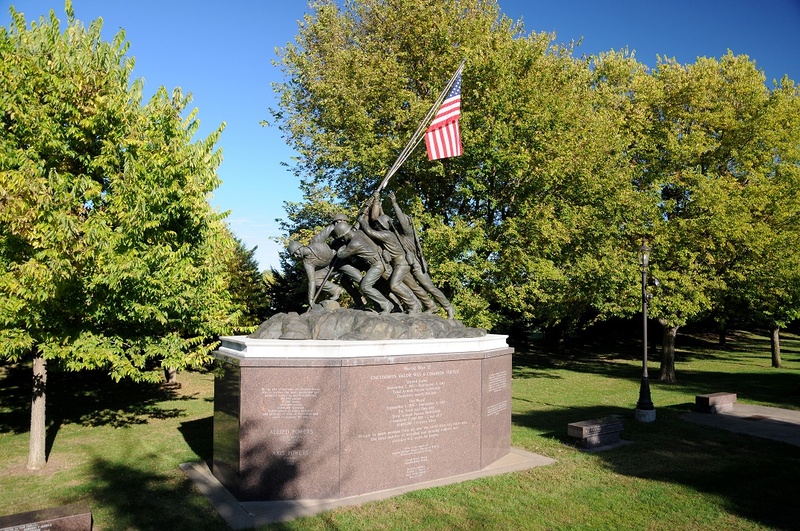 ​Next, along the walk is a monument depicting World War II at Iwo Jima, the raising of the Flag. The battle was immortalized by Joe Rosenthal's photograph of the raising of the U.S. flag on top of the 166 m (545 ft) Mount Suribachi by five U.S. Marines and one U.S. Navy battlefield Hospital Corpsman. This five-week battle comprised some of the fiercest and bloodiest fighting of the War in the Pacific of World War II. The Korean Conflict is remembered with a monument titled "Heading North-Communism's First Defeat". To the left of the Korean Memorial, you will see the roster of area veterans who served their country during this period. This memorial depicts a local veteran, Richard Gamoke, who served in Korea during the war. The Korean Conflict is remembered with a monument titled "Heading North-Communism's First Defeat". To the left of the Korean Memorial, you will see the roster of area veterans who served their country during this period. This memorial depicts a local veteran, Richard Gamoke, who served in Korea during the war. After some early back-and-forth across the 38th parallel, the fighting stalled and casualties mounted with nothing to show for them. Meanwhile, American officials worked anxiously to fashion some sort of armistice with the North Koreans. The alternative, they feared, would be a wider war with Russia and China–or even, as some warned, World War III. Finally, in July 1953, the Korean War came to an end. In all, some 5 million soldiers and civilians lost their lives during the war. The Korean peninsula is still divided today. The Vietnam Conflict is remembered with the Vietnam War Monument and the Vietnam black granite Wall Monument. 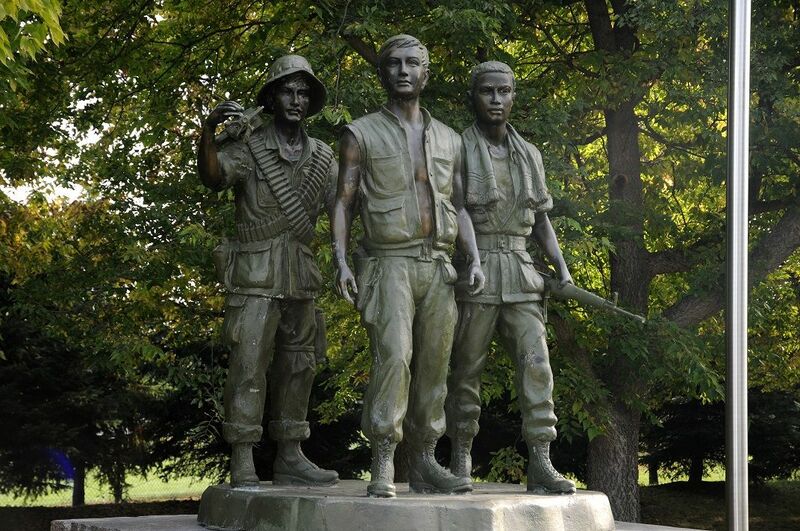 The War Monument depicts a Veteran from the area, David Hesch, who served in Vietnam. 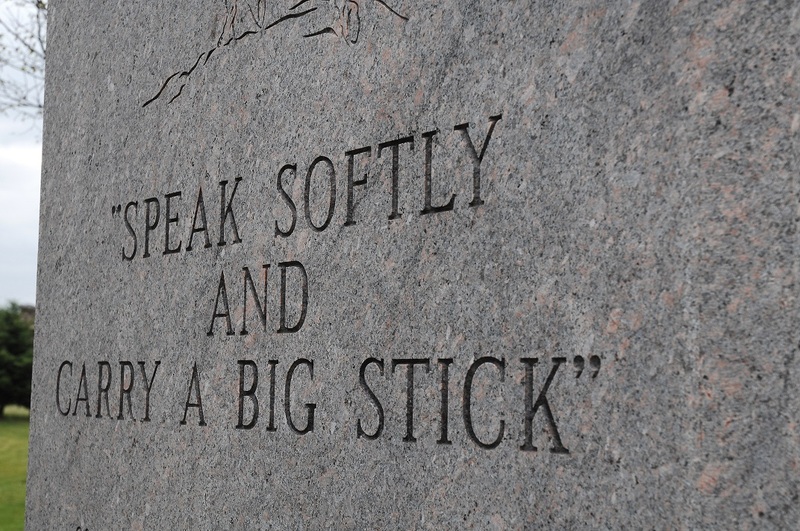 Names of many area soldiers/Veterans are etched into the black granite similar to the Wall in Washington, DC. 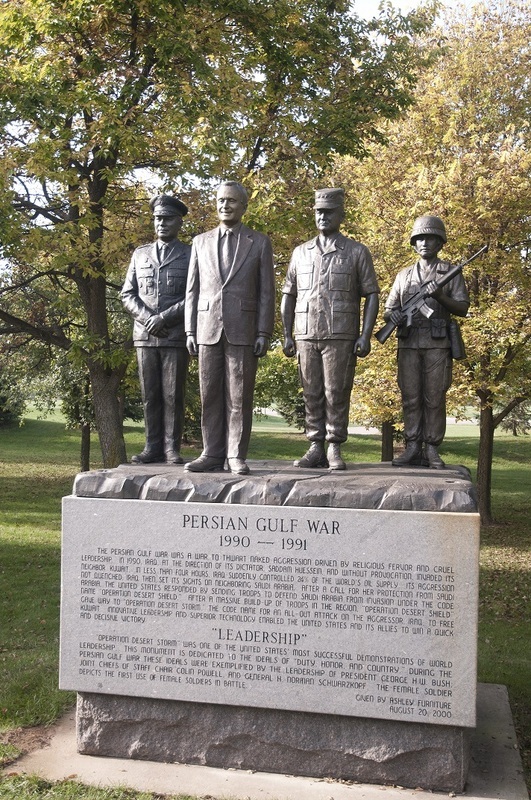 Next in view is the area dedicated to the Persian Gulf War Veterans. The war is also known under other names, such as the Persian Gulf War, First Gulf War, Gulf War I, Kuwait War, or the First Iraq War, before the term "Iraq War" became identified instead with the 2003 Iraq War (also referred to in the U.S. as "Operation Iraqi Freedom"). Kuwait's invasion by Iraqi troops that began 2 August 1990 was met with international condemnation. This is the first recognition of the female soldier, along with George Bush, Colin Powell, and General Norman Schwarzkopf. The newest addition to the Avenue of Heroes is the Memorial dedicated to those who gave their lives on 9/11. A portion of this monument is a twisted and melted steel beam, recovered from one of the Twin Towers in New York City. You will then pass by the Pavilion, one of two permanent structures built to support events within the Memorial Park. The Pavilion has the largest chicken barbecue pit on the American continent. Eighteen hundred pieces of chicken can be grilled at one time on this grill. The Pavilion is the result of the local Lions Club and can be rented for weddings, graduation parties, etc. The next monument depicts the area's agricultural background among the early settlers. 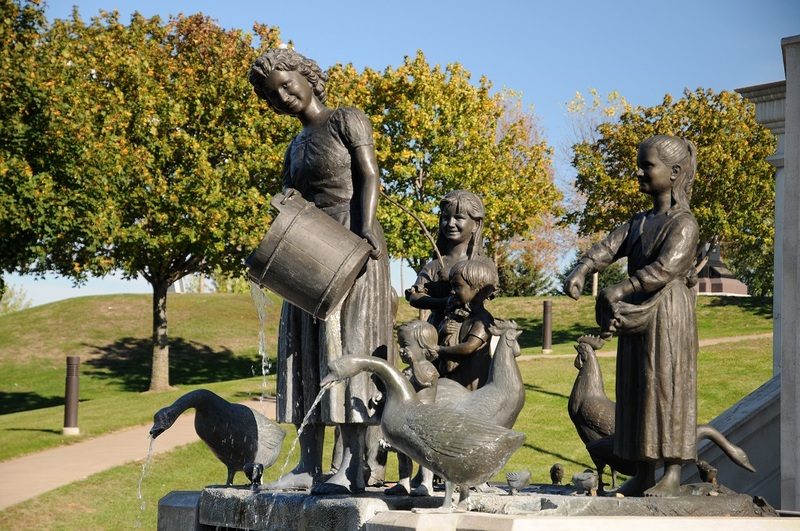 As you stroll along the path you will see another monument depicting the early settlers in the Arcadia area with the farm women and children. The lady resembles the mother of Ron Wanek and the children resemble present day grandchildren of Ron and Joyce Wanek. The man with the horse depicts the father of contributor, Ron Wanek. Much of the Arcadia area was settled into a farming community. The fertile land was perfect for crops and animals. 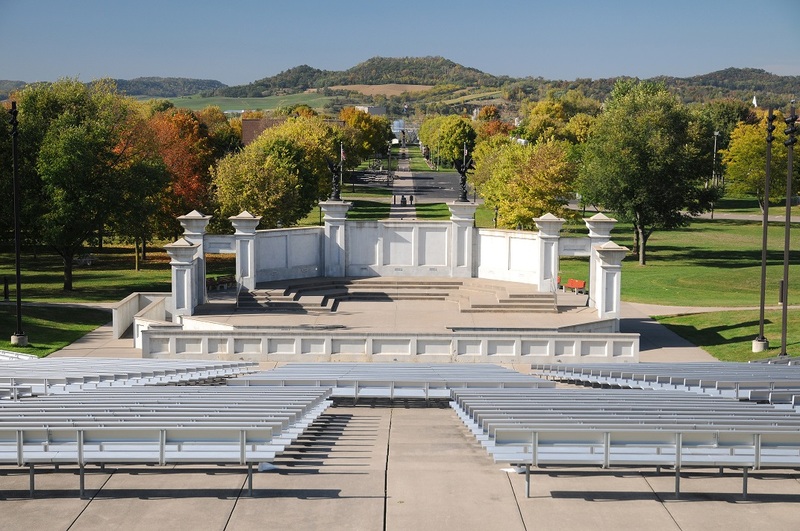 As you approach the amphitheater, you will see the area directly in front of it lined with commemorative bricks which have been purchased by individuals wanting to honor family members and area residents or in memory of loved ones. ﻿The amphitheater was dedicated in 2000 with a concert by Charlie Daniels. 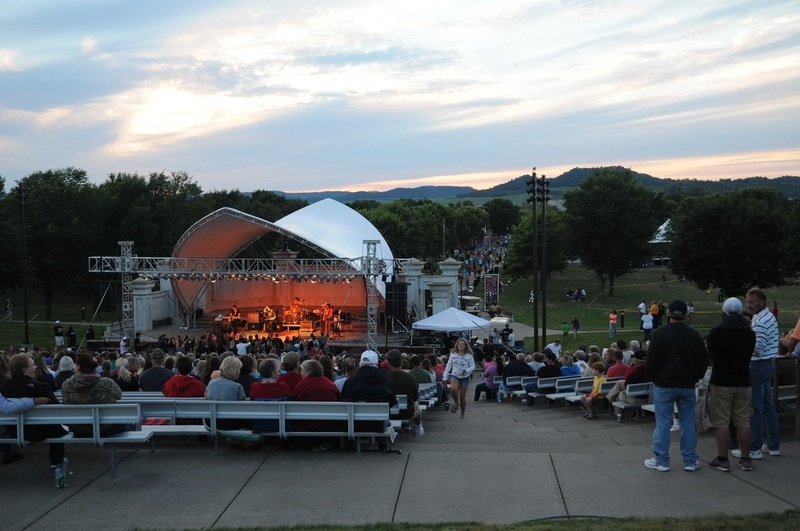 There is a seating capacity in the amphitheater of 2500, with the grassy knolls, capacity increases to 4,500. It is the perfect setting for a summer wedding. Around the perimeter of the amphitheater is the General's overlook. There are statues of General Patton with his bull terrier, Willie, at the base. Others include General Douglas Mac Arthur, Commander of Pacific Forces, Dwight D. Eisenhower, Supreme Allied Commander, John Pershing, Commander of Expeditionary Forces, Ulysses Grant, Civil War General and John Paul Jones, Father of the U.S. Navy. Through the efforts of local Veterans, a Howitzer was obtained. This sits near the amphitheater on the East end of the Avenue of Heroes. Off on the other side of the amphitheater is an F-16 Fighter jet. This is one of two which were decommissioned in 1992. It was shipped to Arcadia in sections, and then assembled to its resting place on the bank overlooking Memorial Park. The pilots resembles local Veteran, Ralph Haines. ﻿What you have seen here is a small sampling of the tributes to this great country and the men and women who fought for our freedoms. To the left of General's Overlook you can't miss the F-16 that is mounted depicting its flight. 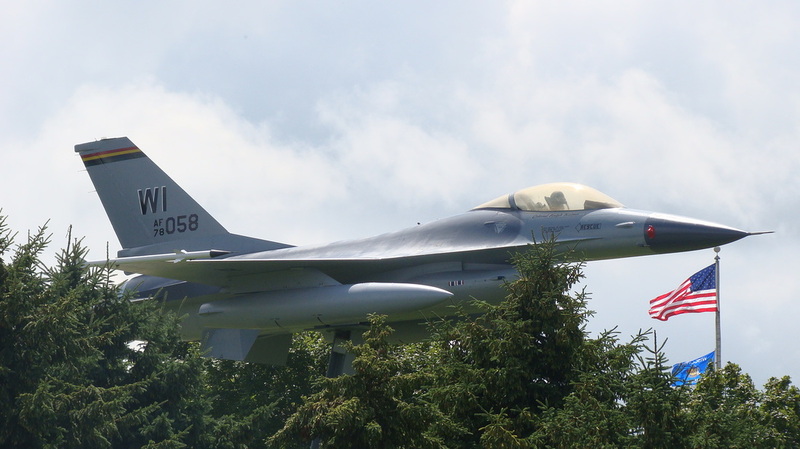 The plane you are looking at is the first F-16 decommissioned by the USAF and was brought to the park with the help of a local area veteran, retired Colonel Ralph Haines, who is also depicted in the Pilot's Seat inside the memorial. Colonel Haines served in the European Theater during WWII, where he flew many missions into Germany from the Army Air Force base in England, flying as a bomber crew member. He excelled in the military, where he devoted nearly 40 years of his adult life before he retired as a full bird colonel. It was no easy task to get the Department of Defense to decommission this plane. It was through Ralph's influence, persistence and persuasion that made this awesome memorial happen. 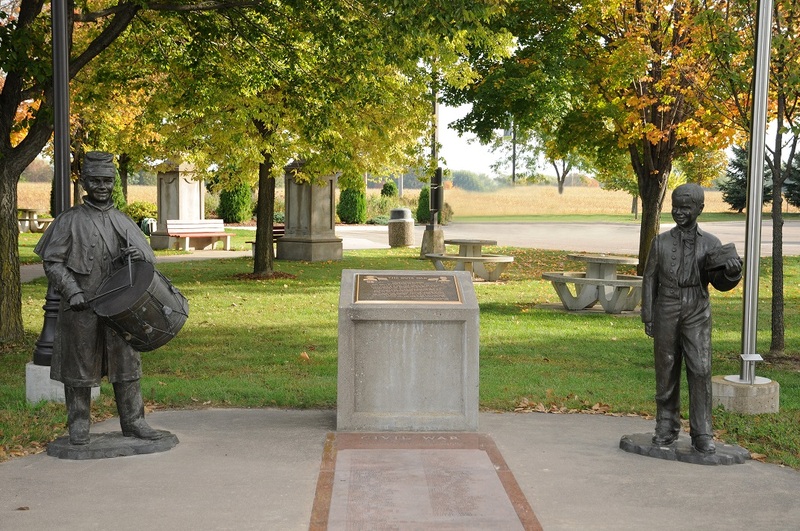 ​As you enter the park from the Soldiers Walk Memorial Park's Visitor Center, you will pass through two statues that honor our POW's, Prisoners of war and MIA's...Missing in action. Founder & Chairman of Ashley Furniture Industries, Inc.
Off to the left of the Millennial Amphitheater, there stands a memorial to Ronald G Wanek. 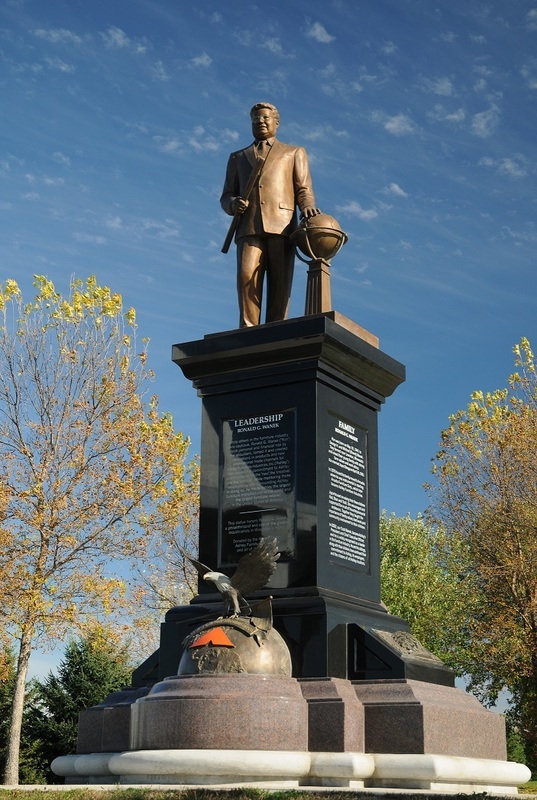 This memorial was designed and placed in the memorial park by his son Todd Wanek, President & CEO of Ashley furniture industries, Ashley employees, friends and the city of Arcadia Wisconsin. 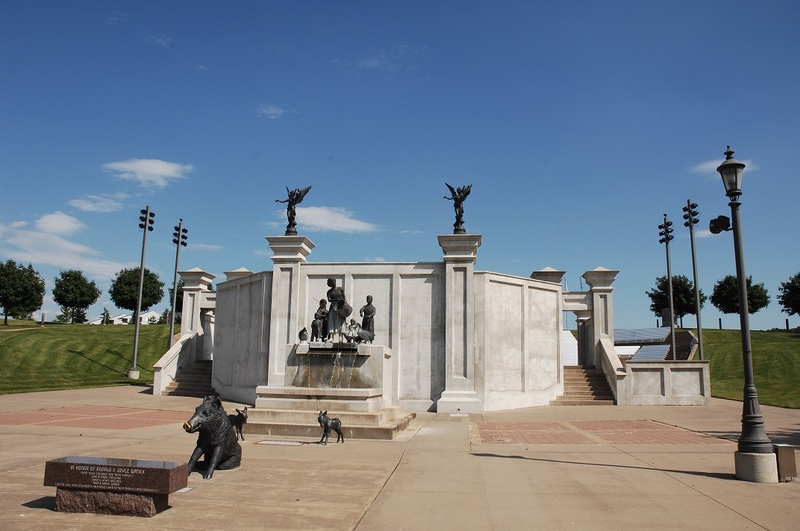 The design elements, the construction and placement of the statue was a complete surprise to Ron until the date of the dedication on August 12, 2011. 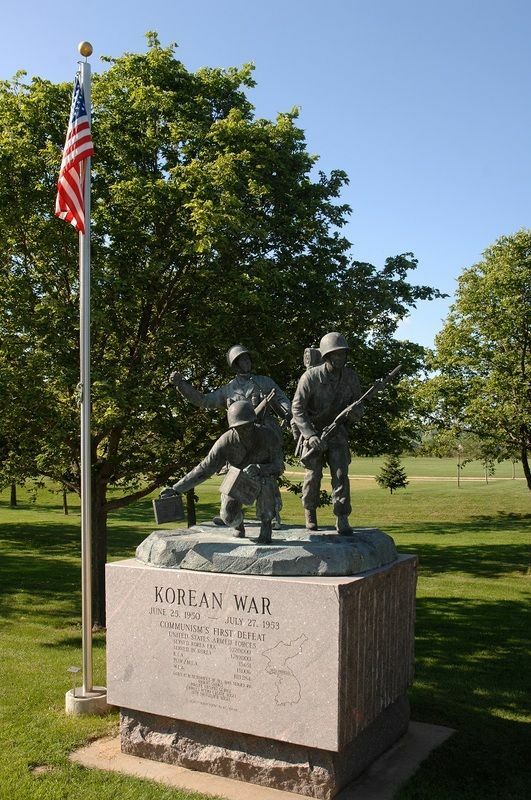 Soldiers Walk Memorial Park is located in Arcadia, Wisconsin. The park is free. The Park is 40 miles north of Lacrosse, Wisconsin, 45 miles south of Eau Claire, Wisconsin, 26 miles from Winona, Minnesota, 48 miles from Wabasha, Minnesota and 72 miles from Rochester, Minnesota. ​If you are coming from Minneapolis and St. Paul, it is approximately 136 miles. From Chicago, Illinois it is 308 miles. 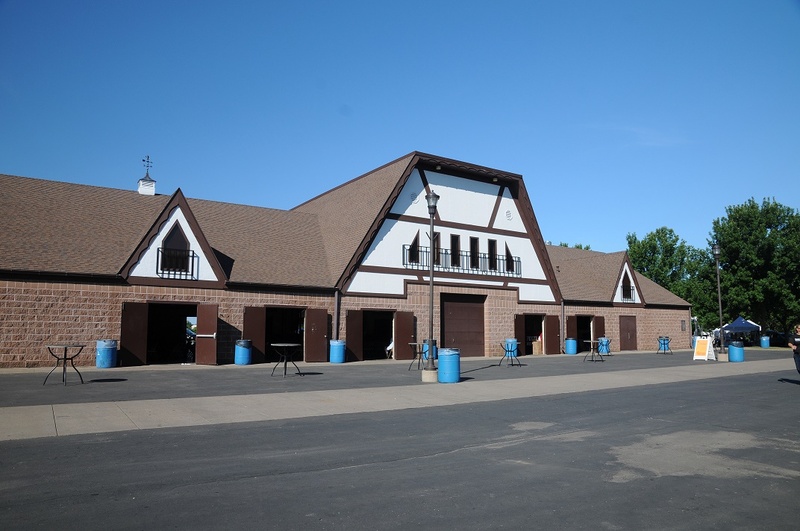 There are plenty of nice hotels and restaurants in the area to accommodate you in Winona Minnesota and the surrounding area. Hwy 53 North to 93 North to Hwy 95. Then West on Hwy 95 to Pearl Street. South on Pearl to Memorial Park. Hwy 93 South to Hwy 95. Designed and Maintained by Napier Marketing Group Inc.